Out Now: Issue 16 of The MagPi @Raspberry_Pi #piday #raspberrypi « Adafruit Industries – Makers, hackers, artists, designers and engineers! 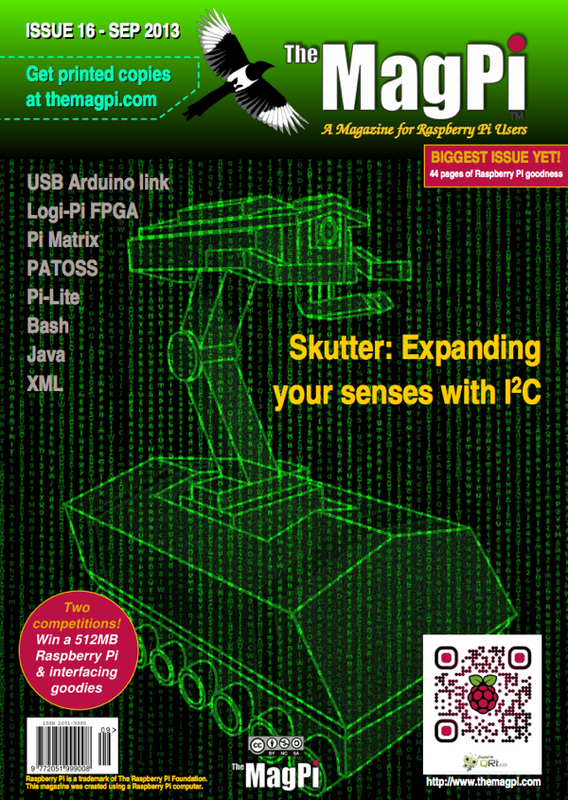 It’s back… Skutter returns to the pages of The MagPi and this time it’s more sensitive! Stephen takes you in detail through expanding the number of inputs and outputs which can be controlled from your Raspberry Pi using I2C. This will allow you to add more sensors to your bot while driving the base unit. In this issue we have some great hardware projects like Jorge’s PATOSS for monitoring his injured bird and we learn how to scroll text on the Pi Matrix. We have more on connecting your Raspberry Pi to an Arduino in Tony’s great article on driving a liquid crystal display plus an amazing look into connecting your Raspberry Pi to Logi-Pi by Michael Jones. After all that, we supplement the above with some fantastic software articles. We are pleased to provide more on programming in Java by looking at control flow sentences, numbers, strings and booleans with Vladimir. For the cherry on the cake we have more from Bash gaffer tape and building and parsing XML in Python. Download the PDF of Issue 16 here!